In the second edition of the D-backs Insider Podcast, we caught up with starting pitcher Barry Enright, who can be found on Twitter with the handle @BarryEnright54. We discussed his upbringing in California, playing college baseball in Malibu, his big league debut in St. Louis and life as a homeowner. There are a few ways to listen to the podcast (length – 26:35). You can use the player below, download it as an MP3 or stream it in your media player. We also grabbed a five minute clip to watch on video. Over the past two years, we’ve tried to not only increase the volume of information we produce with the D-backs Insider brand, but also vary the type of material. In addition to our magazine, which is produced for every homestand throughout the season, you can find more day-to-day material here on D-blog, and more spur-of-the-moment material on Twitter (@Insider_Writer). This is another branch for D-backs Insider. While there is extensive D-backs coverage of all kinds in the marketplace, I’ve felt that long-form interviews with people around the D-backs were lacking. This includes players, coaches, executives and local media, perhaps even national media and Major League Baseball executives. We plan on using D-backs Insider Podcast to allow you to truly get to know who these people are, where they came from and what makes them tick. 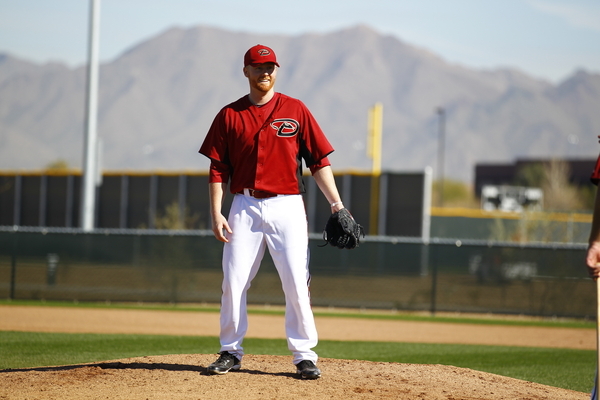 Our first guest is D-backs left-handed reliever Joe Paterson, a Rule 5 pick this past winter. Next week, our guest on the second D-backs Insider Podcast is starter Barry Enright. In the future, I’ll use Twitter try to solicit questions from you, the fans, to ask of our guests. I hope you enjoy the Podcast, and I hope we keep improving it with each issue we produce.